Happy New Year to all our clients and readers from the team here at Equitile. Unquestionably 2016 has been a fascinating year and we expect 2017 will prove to be equally fascinating. At this time of year it is traditional to reflect on the lessons of the year passed and muse on what may lie ahead. With Donald Trump just days away from the US Presidency, this year the exercise feels more worthwhile than ever before. 2016 was dominated by the decision of the British electorate to leave the European Union and the decision of the American electorate to elect Donald Trump as the 45th president of the United States. Although independent events, we at Equitile believe both Brexit and Trump are best understood as part of a single process: a rejection of modern globalisation by the working class of developed Western economies. To understand why Western workers have turned against globalisation and what it implies about the future investment climate we think it is necessary to go back to events of the late 1980’s, the end of the Cold War and the fall of the Berlin wall. 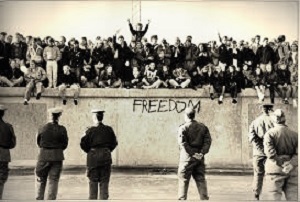 1989 was defined by the tearing down of the Berlin Wall when modern globalisation really got started. Similarly, 2016 was defined by Brexit & Donald Trump winning the US presidency. The former promising barriers to European migration, the latter to build a Mexican border wall. Globalisation began in 1989 with walls coming down and borders opening-up, it ended in 2016 with promises to put walls up and close borders down. Arguably, the first steps toward modern globalisation were taken in the early 1980’s when Eastern European workers began rebelling against the soviet system through the Solidarity movement in Poland. Ultimately that worker revolt led, in 1986, to Michael Gorbachev’s policies of Glasnost (openness) followed with Perestroika (restructuring), and those in turn to the fall of the Berlin wall in 1989 and the start of what we now call globalisation. As an aside, as a young student, I cycled from Berlin to Prague shortly after the wall fell. We left Berlin on 22nd July 1990, the day after Pink Floyd had played their iconic Berlin Wall concert to commemorate its fall. We arrived at the Czechoslovakian border by Varnsdorf just a few days after it opened to Western Tourists. We must have been some of the first Western tourists to enter Czechoslovakia by bicycle. By the time we arrived in Prague the city was buzzing – the optimism was palpable. And, after hundreds of miles on cobbled roads the famous Czech beer was very welcome. The cooperative geopolitical climate which emerged in the early 1990’s continued the sense of hope, optimism and comradery I witnessed in Prague’s Old Town square in the summer of 1990. World leaders set aside narrow national interests and set about building a new world order. Western economies opened their markets to imports from the former communist bloc and, in the case of Western Europe, eventually opened their labour markets to migration from Eastern European countries. At the same time the former communist countries welcomed inward investment, thereby encouraging a reindustrialization of their own economies. In Europe, a path of full re-integration was pursued, bringing Eastern and Western countries into a single European Union with full mobility of goods, services, capital and labour across the region. In effect, the United States and China followed a similar though less comprehensive path of economic integration. China opened itself up to inward investment and industrialization while America opened its markets to Chinese exports thereby creating the economic union which the historian Niall Ferguson dubbed ‘Chimerica’. The goal of this global economic integration was to create a win-win situation by helping less developed countries catch-up with the economic development and living standards of the West. The idea was to grow the size of the cake (the global economy) without worrying about size of individual slices: provided the cake grew fast enough all slices were expected to get bigger. It was understood, at least by the leaders, that globalisation meant the West having a relatively smaller slice of the cake, but as that slice was expected to be bigger in absolute terms, the trade-off was believed worthwhile. The globalisation process worked as expected. From the early 1990’s up until the global financial crisis of 2008 – a Western economic crisis caused by excessive debt – global growth was strong, especially in the economies of Eastern Europe and China. Perhaps the simplest way to understand the economic effect of the fall of communism is to think of it as having delivered a massive positive shock to the global labour-market. Almost overnight, hundreds of millions of well educated, highly motivated, low-wage workers entered the global labour force. With the benefit of hindsight, it is now obvious that this global labour-market shock produced two groups of winners and one group of losers – at least on a relative basis. The first winning group were the low-wage workers of the emerging economies. In Europe, this group benefitted both from the opportunity to work in higher wage Western Europe and from inward investment into their own economies. In other emerging economies, especially China, workers benefited from rapid industrialization facilitated by inward investment, technology transfer and the ability to export their products, primarily to America. The wages and living standards of this group began converging with those of Western workers. The second winning group were those at the top of the social order in the Western economies. This ‘elite’ group who owned the capital or benefitted directly from return on capital enjoyed the benefits of higher corporate profitability resulting from the combination of bigger markets and lower labour costs. The losers were the relatively well paid workers of the developed Western economies. This group found themselves in direct competition with cheaper developing world workers. Western wages stagnated in absolute terms and fell backwards relative to their emerging market counterparts and even more so relative to the ‘elite’ within their own countries. The Achilles heel, of the recent globalisation process was always this downward pressure on Western wages. The export driven reindustrialization of the developing countries relied on maintaining buoyant demand from the Western economies, but demand growth was difficult to achieve given the stagnation of Western workers’ wages. In practice, the problem of Western wage stagnation was ‘solved’ with debt. The spending power of the Western worker was augmented with a borrowing boom. In the minds of the Western central bankers, who had chosen to worry only about inflation, the lower interest rates needed to fuel this borrowing boom could be justified by the falling inflation caused by the wage competition from emerging economies. The question of how Western workers could service the rising debt with their stagnant wages was left unasked – at least until 2008. The process of Western credit expansion, which sustained globalisation, also meant an unusually profitable environment for the Western banking system, which saw its profits surge as debt levels expanded. The higher profitability of the banking system together with the rising levels of worker indebtedness served to exacerbate inequality within Western economies. At the risk of sounding overly emotive: for this flavour of globalisation to work, Western workers were required to borrow themselves out of their jobs. It is no coincidence that the disenchantment with globalisation became manifest shortly after central bank monetary policy lost its potency. If there is a surprise in the 2016 backlash against globalisation it is that Western voters did not demand a policy shift much sooner after the 2008 crisis. In both Europe and the United States two ‘revolutionary’ anti-globalisation movements have now emerged. The largest and so far, most successful of the two is a resurgent nationalism, energised by the decline of Western wages relative to those of the developing economies. The second, so far, less successful movement, is a resurgent socialism, energised by growing inequality within Western economies. In the US and UK Donald Trump and Nigel Farage respectively have led the nationalist rebellions to power. Although the socialist rebellions of Bernie Sanders and Jeremy Corbyn have not yet gained power they nevertheless enjoy strong and growing support. Both the nationalist and socialist rebellions are energised by similar forces and despite some unpalatable aspects, are driven by valid concerns. In an ideal world, global leaders – the elite – would have recognized the unsustainability of debt-fuelled globalisation if not before the 2008 financial crisis then at least in its immediate aftermath. In practice, this did not happen. After the 2008 crisis policymakers made every effort to revert to the unsustainable pre-crisis policy mix. With the Brexit and Trump votes of 2016 Western workers – which in large part are also the Western electorate – demanded a better deal from globalisation and by implication, a move toward more sustainable economic policies. There is much about the new political climate that worries us. Anyone with even a limited knowledge of twentieth century history cannot help but pause when they find themselves discussing nationalist and socialist movements in the same sentence. That said, for the reasons set out above, we do not believe the existing debt-fuelled model of globalisation can be sustained and much of what concerns us in today’s political climate can be attributed to policymakers having disregarded the interests of those on the losing side of globalisation. It is for this reason we find ourselves cautiously optimistic that 2016 may end up triggering some long overdue reforms. If, as we expect, 2016 does mark the beginning of the end of globalisation then, as investors, we must consider what the new environment may look like and what it implies for asset markets. It is still too early to hold firm views on the new world-order. That said, it seems reasonable to expect at least some of the post 1989 trends to move into reverse. As Western governments revert to a more domestically focused policy agenda, we expect greater efforts to insulate Western workers from emerging market competition. Whether through restrictions on trade or migration the aim would be to reduce wage competition, thereby potentially facilitating the re-emergence of inflationary pressures. Though unpleasant, this may prove to be the least-worst way to help alleviate the real burden of the debt-load accumulated during globalisation. Since 1989, it has not been necessary for investors to worry about inflation; Western bond markets have been the asset class of choice. The post 2016 environment may be much less generous to bond investors in real terms and inflation protection may re-emerge as investors’ primary concern. This would make the inflation protection afforded by equity markets more attractive. At this stage, the Equitile Resilience fund remains fully invested in equities and we have no intention of changing this asset allocation. Globalisation meant high global-growth at the expense of relatively lower developed world economic growth. Post 2016 this trend may also reverse with emerging economies finding it more difficult to import growth from developed economies, while overall growth rates fall. We expect the United States will be best positioned to take advantage of this new environment. In Europe the key question remains: Does Europe pull together around its new European Union identity or pull apart reverting back to its prior national identities? Based on recent developments, we see the pulling apart scenario as more likely; the EU does not appear to have taken the Brexit vote as the call for reform that we think it was. This leads us to contemplate a scenario whereby at least some Euro-zone countries eventually revert to their national currencies. The majority – over 80% - of our investments are currently the North American markets where we are finding it easier to identify the reliable higher growth companies we favour. Again, we don’t expect to change this allocation in the near term. In the last few months of 2016 there was a strong sector rotation within the equity markets. High-growth companies underperformed low-growth companies as markets priced a generally higher rate of US economic growth. Highly leveraged companies, especially banks and financials, also performed especially well. Focusing, as we do, on investing in high-growth well-financed companies our fund underperformed this ‘Trump-Jump’ sector rotation at the end of 2016. Despite believing the US is positioned to do relatively well in the new environment we expect average growth rates to remain subdued for some time suggesting the pockets of growth that are available within the market should still command a premium. In addition, we view 2016 as recognising that Western economies need to wean themselves off their reliance on debt accumulation to support growth. Therefore, we do not see 2016 as marking a return to rapid credit growth and remain happy to avoid the banking sector. We will not be shifting from our focus on well-managed, well-financed, high-growth companies. At the sector level, we acknowledge a more nationalist climate is also one in which international tensions can escalate more easily. We have recently increased our exposure to the aerospace and defence sectors. Overall 2016 has been an important year. We believe that we are at the start of a new chapter in world history and therefore a new chapter for financial markets. We feel lucky to have launched the Equitile Resilience fund in such an important year, and privileged to have a front row seat to watch the new environment emerge. We begin 2017 excited at the prospect of navigating the investment challenges ahead.